Once there was a young man in search for himself who found death in Alaska instead. Then there was a news article followed by a book by the same author (Krakauer), and finally there was a movie (screenplay was adapted from the book). And then there was me, watching the movie. I can’t exactly say that I liked the movie, or that I could recognize or identify with the message it sent. However it has an amazing soundtrack (Eddie Vedder) with great lyrics, and it also has some broad, vague tone that I liked. I enjoyed watching the movie (many times), I always got touched by Chris’ untimely end but I can’t say that I understood him. So I decided to track back, and try to find and understand everything that was potentially missing in the movie. And it turned out that there was only one more step that I could take - the book. Chris MacCandless did not leave enough of his own “voice” in the form of diary or letters to “speak” for himself, so, Krakauer gathered all available resources and filled in the blanks. And there were many blanks, so many that he had to stretch the available material as much as possible and fill it in with stuff unrelated to Chris’ story, including accounts of his own (Krakauer’s) Alaskan adventures. To be honest, the task at hand was impossibly hard - understanding and deciphering intimate thoughts, goals, plans of an introvert person, mostly based on the stories of the people that he met. 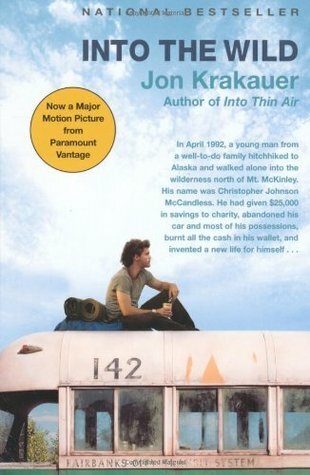 At the end, I don’t feel that I understand Chris MacCandless any better after I read the book, but I do know now some additional facts about his life and trips, things omitted or misrepresented in the movie. I was not too quick to judge him and his misfortune after I watched the movie, but even now I can’t rationalize or approve the way he put himself in danger, nor what he was trying to achieve.